With the Opening Ceremony of the London Olympics tonight, Friday 27 July, I thought I'd post a picture of an ancient games arena in London dating back to Roman times. 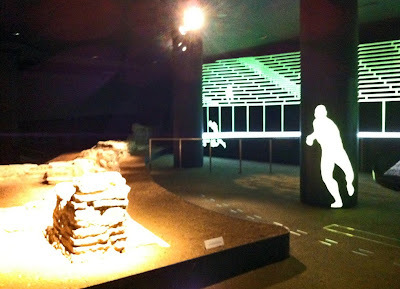 The photo shows the remains of London's only Roman amphitheatre, which lies beneath the Guildhall Art Gallery. Sport and entertainment in ancient times was shockingly bloodthirsty by modern standards. As well as watching races and athletics, crowds would have gathered to enjoy wild animal fights, public executions and gladiatorial combats. The remains of the original circular walls of the amphitheatre were rediscovered by archaeologists working on the site of the Guildhall Art Gallery building in 1988. The museum and remains of the amphitheatre are free to visit. You can find them at Guildhall Yard, London EC2V 5AE. Wow, incredible blog laуout! Нoω long have уou been blοgging fоr? you made blogging look еasy. The οverall look οf your webѕite іѕ eхcellent, as ωell аs the content! Thanks for the nice words. I use a standard Blogger template, as I mentioned the other day. I've been blogging for about five years.